On asking Val Heart to help with my companion dog, Elsa. Elsa is an extraordinarily perceptive, kind, co-operative and loving dog with a strong personality and a great sense of humor. She is great company and will do anything to try to help in our lives together. She is so gentle, I can take food out of her mouth without any protest. This, however, was not our neighbors’ perception of her. They could only see and hear a loud, piercing and persistent bark and an intimidating, crazed dog. She barked at anyone walking by the house, delivery vans, cars, cats, birds, and above all the postman. If any visitors came to the house she would bark over them every time the spoke or moved around. If we needed a workman round, she would have to go to my mum’s. She never attacked or bit, but was always very vocal. People were annoyed and felt intimidated. I was upset because people couldn’t see her loving nature. The neighbors complained and relationships became fraught. In her training, diet, and exercise we had always been very conscientious. Nothing was more important to me than the health and happiness of this girl. I increased my efforts in training. People suggested all sorts: sound devices that would hurt her ears, electric collars etc. but I was not prepared to use any method that would hurt her or bully her. I knew that if Elsa understood a situation, she would do everything she could to contribute positively because that was her nature. 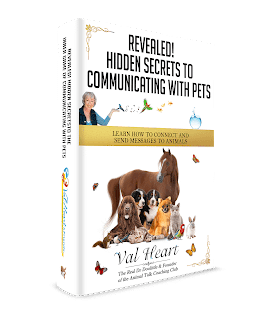 So I signed up to Val’s beginning animal communication course. However, when she started to become aggressive towards other dogs in the neighborhood, I realized that swift and strong intervention was needed to avoid anyone getting hurt or worse. I signed up to Val’s 3-month behavior intervention plan. This wasn’t like any doggy training I had done before! Val helped clear up misunderstandings around my ‘no bark command ‘ straight away and showed me how to successfully redirect her when barking. Elsa had thought we were playing a completely different game! Val picked up on Elsa’s nervous energy and taught me some calming breathing techniques to do together. She immediately became generally calmer. Sometimes I thought I was imagining it, but my mother, who knows her well, confirmed my impressions. Elsa was 2 kilos overweight and reducing her food intake, even more, seemed impossible, as did getting in more exercise daily. Val felt into Elsa’s body and following her advice, giving her a different kind of meat, she dropped the 2 kilos naturally. Val communicated my concerns to Elsa about her behavior towards other dogs. The following day we came across her arch doggy enemy whose guardian suggested we let them sort out their differences in a controlled way. Synchronicity in action. We had never been able to speak before – the aggression and fighting had been so loud and immediate. This time, they snapped at each other a little, then sniffed bottoms, and carried on their way. I no longer had to worry about avoiding particular routes or times of day. She’s still happiest off the lead with other dogs, still a little wary of two in particular, but we haven’t had a horrible aggressive incident since. Val taught me that animals mirror the deepest, most intimate parts of us – Elsa had been sensing my own anxiety around life and people and doing her darndest to protect me at all times! I had assumed this anxiety was just an immovable part of me. Val challenged this and showed me that if I wanted Elsa to become calm, sociable and happy, I had to become calm, sociable and happy. Val has helped me to start a journey of finding and healing my deepest fears– not quite effortlessly, but almost! Elsa continues to mirror my changes. I’m still working on this and Elsa mirrors my progress. Val has been the kindest, wisest and clearest help to both of us. I was concerned about the financial investment initially – we don’t usually have money left over at the end of the month. I’ve been able to find some extra work to fund this and it has been worth every penny. Elsa is happier, healthier, relationships with neighbors are improving, and a whole new way of perceiving my life and the world is opening up. I am so relieved that aggressive incidents have not recurred, and we don’t have to move house to protect Elsa. I’m also so happy to be able to work with Elsa rather than subdue or ‘tame’ her enthusiasm for life. I’m so glad that I followed my intuition telling me that harsh methods were just not the answer. Every conversation with Val is like nothing I could predict or expect! I feel I am in safe hands, learning so much about the nature of the universe and all the precious beings who are part of it.